SOLD (Set of Four) Continents: America, Africa, Asia, Europe. Published by Herman Moll in "ATLAS MINOR", Second Edition 1732, and printed and sold by Thomas and John Bowles, London. A charming set of maps of the continents with many interesting features. 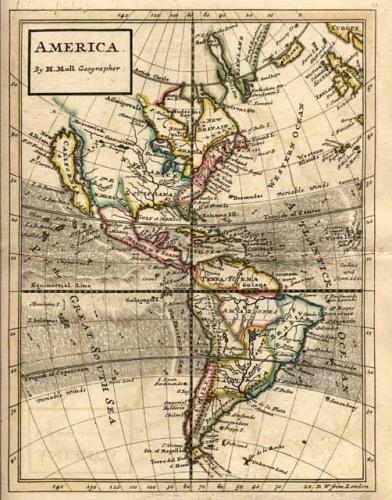 Americas: The map shows both North and South America with California as an island and an unexplored north west. Moll shows typical wind directions and flows over the oceans between the Tropics of Cancer and Capricorn. Africa: Moll has included much detail - bodies of water, rivers and the principal cities are named and prevailing winds are shown in the oceans with lines and arrows. There is a spot in the margin that does not detract from the overall impression. Asia: Interesting features include the upper coast of "Chinesian Tartary" that is shown as "Unknown Coast". Also, this map was produced before Cook's expeditions later in the century and, reflecting the cartographic uncertainty of the times, New Holland is almost joined to New Guinea. Europe: Country outlines in rich hand colours. Interesting features include 'A salt water lake', the coast of Greenland described as 'Ice and Mountains covered with Snow' and 'Turkey in Europe' that extends deep into the continent. Slight foxing in the margins. These maps are not often seen on the market as a set and overall they are in very good condition. The country outlines are hand coloured in four colors. The paper is strong with ample margins for framing.